For our first meeting of the 2017/18 season, Peter Layzell entertained us with images of newspapers of an earlier time, reflecting views of the past. They covered health, crime, education and more. He emphasised that attitudes were different over 100 years ago and so we cannot judge the behaviour of people by today’s standards. Temperance and political meetings were advertised, also concerts and songs from the music hall. In April 1895 a headline in the Chelmsford Chronicle read The Bradwell Horror. James Instance and his family lived at Mill End and it was discovered that his daughter Harriet, aged only 15, had given birth to a child. The police had been alerted by suspicious neighbours and confronted the family. At first Harriet denied the accusation, but later admitted giving birth in the closet. This was searched, but on finding nothing they examined the house. Blood-stained sheets in the bedroom were found and Harriet admitted that she had hidden the child up the chimney. It was duly found, wrapped in a sheet. She made a statement to the police that her brother George (known as Bob, aged 25) was the father of her child and he was duly arrested. In May the Chelmsford Chronicle reported the Inquest, a lawful requirement from 1887 for an unnatural death. This was held at the Queens Head, the local pub being the usual place for such an event, the host laying on food for everyone, with customers probably in another room. As Doctor Edward Pettifer was of the opinion that the child had lived, the case was now murder, which Harriet denied. However, she was not charged with murder, but for manslaughter and concealing a birth. The jury consisted of middle class men and found her guilty of concealment but not guilty of manslaughter, death being through lack of proper care. Crowded housing was blamed, the family having had 13 children and only two bedrooms. Harriet was sentenced to three months imprisonment. She later married and had at least seven more children, dying aged 77. Her brother George pleaded guilty of criminal assault and was sent to prison for 18 months. Newspapers around 1900, as today, printed a variety of subjects. In 1896 the Tilbury Cottage Hospital opened, built by Passmore Edwards; before that patients had to go to Southend or Gravesend. There were various reports of accidents and in 1893 a small boy died falling into the fire – many children died from burns from open fires and accidents with candles. Crime was duly reported, the Petty Sessions holding two courts each Friday. Such crimes included keeping a dog without a licence, driving without lights, drunk and refusing to leave a pub, bad language, etc. The Quarter Sessions dealt with more serious crimes – theft, indecent assault, house breaking and even refusing to work in a workhouse. Papers reported on education, the Grays National School being found unsatisfactory in 1905. Parents were fined 4 shillings for non attendance of their children, further absenteeism resulting in them being sent to Industrial Schools. The weather, sport and leisure were covered, including the model yacht club, swimming at the bathing pond, outings to Southend and advertisements for agricultural shows. Fox hunting and even otter hunting fixtures were shown. Jobs, medications, such as Beechams pills, were advertised and of course pubs and their beer. In 1900 £1 was worth £112 in today’s money, an agricultural labourer earning 15 shillings per week. It is difficult to imagine how hard life was at the beginning of the 20th century, and the two musical renderings played by Peter Layzell gave us a taste of life then. At our October meeting ex policeman Martyn Lockwood enlightened us on how we have treated the poor in the past. The Reformation in 1534 meant that the poor could no longer receive help from the monasteries and they turned to the parish. The old system had saved many from starvation and there was social unrest, with an increase in crime and begging. Various legislation came about in 1601 by Queen Elizabeth I. Beggars had been ill-treated, branded, whipped and sent out of villages to roam the countryside. In the 16th century parish registers started to keep records; funds were collected for the poor, aged and ‘decayed’, known as the Vagabonds Act. Overseers were appointed to collect the poor rate, but it was not popular. The 1601 Poor Relief Act covered the appointment by the vestry of two overseers, a parish constable for law and order and people to maintain the highways. Relief was dispensed - indoors in the workhouse and outdoors with food or clothing. Workhouses were at first a cottage in a parish. The able bodied were set to work on jobs such as picking oakum, used for caulking on ships. Children became apprentices for payment and some were sent to sea. The 1662 Settlement Act established the parish where each person belonged (repealed in 1834). In 1723 a new act was set up for poor relief on a larger scale, parishes grouping together to build workhouses, ran by the Board of Guardians and funded by a local poor rate. There were serious problems after the Napoleonic wars, ex soldiers being forced to beg and unemployment was widespread. There was rioting and a Vagrancy Act was set up to control beggars. New regulations in 1834 stipulated that parish workhouses should be worse than a home situation and a workhouse test was devised to test between the deserving and undeserving poor. Our local workhouse was built in Orsett. Staff lived on the premises and there were strict rules and regulations for the inmates. Their food was basic, with silence at mealtimes. Families were split up, although parents saw their children on a Sunday. Many children had no family and were instructed at school for three hours each day; they were taught the three Rs and Christian religion. By 1881 most workhouse inmates were agricultural labourers and various punishments were inflicted for small misdemeanours. There was no provision for tramps and beggars, although they could stay overnight after doing a day’s work; their clothes were fumigated and they were locked in cells overnight. The inmates celebrated Christmas Day, being served Christmas pudding and roast beef, some being entertained by parish ladies singing. The OAP act in 1908 gave 5 shillings a week at the age of 70. The workhouse system declined and by the 1930s local councils took over welfare. This was a sobering talk and although the poor will always be with us, at least the workhouses are no more, most of them being turned into infirmaries. At our November meeting we were taken on an A-Z history tour of Thurrock by local historian Kevin Diver. He started at Aveley where a mammoth was discovered in 1964. This was followed by various bridges, including the WW1 pontoon bridge from Tilbury to Gravesend and continued through the cement industries and the docks, where the new DP World and Tilbury are still expanding. E covered evolution as discovered by Alfred R Wallace, with F standing for the fleece which the Sturgeon family sold from their stock of Merino sheep obtained from George III. I was for invasion, forts being strategically placed where the Thames narrows. The Jacobites were held at Tilbury Fort after the battle of Culloden and the Kynoch Works produced explosives, their Lion logo still being used in the USA. L stood for lost landmarks, including Belmont Castle, Belhus and now Tilbury Power Station. M covered the Mucking dig where Saxon pottery etc was discovered. There were several Naval Training Ships in the Thames where orphans and street urchins were trained. The Orient Line was next, their ships all beginning with the letter O; also used in WW2 for troops and merchant shipping. P was represented by PLUTO (pipeline under the ocean – across the English Channel), which was 70 miles long and assembled at Tilbury Docks. Queen Elizabeth I was ‘Q’, famous for her armada speech at Tilbury in 1588. R covered the riverside where Grays beach opened in 1906 and now has container ports, warehouses and industries. S was the shoes made by Bata at Tilbury from the 1930s until it closed in 2005, the estate providing affordable housing, a cinema and swimming pool. There were various tunnels (T) in the area; the Tilbury/Gravesend one was never built, but the Dartford Tunnels were operational from 1963 and 1980, with the bridge in 1991. They carry 130,000 vehicles per day, with a new crossing now being discussed. Vincent motorbikes covered V, their 1940 Black Shadow was the fastest motor bike in its time; Philip Vincent is buried at Horndon. W was Water supplies, including Cash’s Well at Vange. Our area is built on chalk which provides a reliable source of fresh drinking water. X stood for Extras, used in the film industry, including The Guns of Loos, Four Weddings and a Funeral, Quatermass 2, Batman Begins and the TV series Taboo. Yachting represented Y, the local club being active since Victorian times. For some time it used the The Gull lightship as its headquarters but all that is left now is the lantern. Finally, Z was for the Zeppelin L15 which the Purfleet gunners played a part in bringing down in WW1. Kevin gave us an enjoyable illustrated trip through the alphabet, with a plethora of facts. Our Christmas party meeting this year was a bit special. This is our 65th anniversary year. 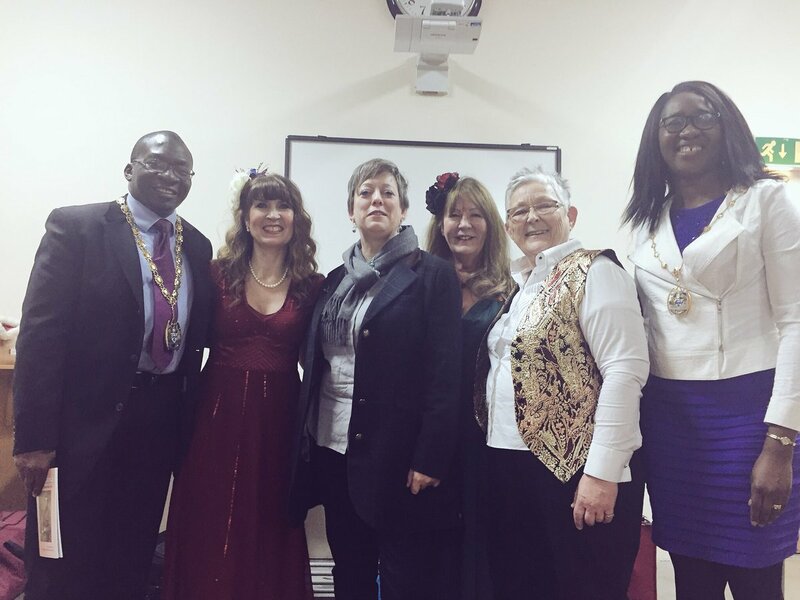 To celebrate we were joined by Thurrock MP, Jackie Doyle Price and Thurrock Mayor, Councillor Tunde Ojetola. To make the evening go with a swing we were entertained by Sentimental Journey: a duo who specialise in songs from the 40s and 50s. Members joined in the singing and some even danced in the aisles. There was good food and a raffle, rounding off a very enjoyable evening. We began the year with an illustrated talk on Essex Curiosities by our Chairman, Susan Yates, with sad and hilarious stories. In April 1884 the most devastating earthquake in 400 years took place at Colchester, most of the buildings in Wivenhoe and Abberton being demolished. In Abbess Roding John Thurloe, son of the rector, was a spymaster for Oliver Cromwell. There is a tradition that the Beauchamp Roding puddingstone was moved three times from the top of the hill to the bottom each night, where the church was eventually built. A plaque at Birdbrook church shows Martha Blewitt who had 9 husbands and Robert Hogan who had 7 wives – whew! Vicar’s son John Gauden was born at Mayland in 1605, won a place at Cambridge when he was 16 and was made Bishop of Exeter in 1660. About 1872 the Rev Arthur Pertwee of Brightlingsea provided a flashing light on the church tower to aid mariners. Canewdon was the centre of witchcraft, with a witch on the village sign. There are still witch dolls in windows of some houses. Susan was cursed by a villager with the sign of a white witch on her bicycle, then promptly fell down the step! The church at East Horndon is now poorly maintained and the grounds overgrown. A legend says Sir James Tyrell was asked to kill a ‘dragon’ there which had escaped from a Thames ship - he slayed it but died from his exertions. Another legend is that Anne Boleyn’s head or heart is buried there. At Galleywood two sisters inherited money – one built the church and the other a racecourse round it in 1759, the railings still in evidence. In September 1916 two airships came down at Great Burstead. One was shot down, killing all on board, the other landing intact at Little Wigborough. The same night a baby girl was born and named Zeppelina. At Great Dunmow Lionel Lukin invented an unsinkable lifeboat in 1794. Another story is of a Miss Lee, at Great Waltham. After being disappointed in marriage she awoke one night and saw an old lady in her room, supposedly her late mother who said they would be re-united at midday. Sadly Miss Lee died that night, aged only 18. At Hatfield Peverel Maude, daughter of a Saxon nobleman said to be son of Ethelred the Unready, was credited with founding the priory and said to be buried in the church walls. At Hutton there is a headstone by the side of the road, commemorating the death of PC Robert Bamborough who was killed by man he was escorting to prison. ‘Brizes’ mansion at Kelvedon Hatch was built in 1720; in 1882 the tenant prosecuted Mr Randall, a poacher. Mr Randall begrudged this and in 1906 built a row of cottages in full view of the manor, causing a blot on the otherwise open landscape – to this day they are known as IOU cottages. The battle of Maldon against the Vikings took place in 991, ending in Anglo-Saxon defeat and a payment in silver, known as ‘Danegeld’. At the United Reform Church there is a blue bullseye plaque erected as a result of the popularity of the Rev. Joseph Billio. All Saints Church has a unique triangular steeple, with a window erected in memory of a descendant of George Washington. Several boat owners at Paglesham were smugglers, one of whom was William Blyth. He was also a grocer and churchwarden and often wrapped groceries in pages torn from the parish registers. A Sgt Adam Eves was murdered at Purleigh in 1893; his body had been horribly mutilated and two brothers were accused of the crime. One pleaded guilty and was hanged, the other pleaded not-guilty and was sentenced to life imprisonment. A large cemetery at Bicknacre is near the old leprosy hospital of St Giles. It is divided in two – one part for the lepers and the other for the nuns who tended them. Kate Luard was buried at Wickham Bishop in 1962. She was born in Aveley in 1872, trained as a nurse and sent to South Africa during the Boer War. In 1914 she joined the Queens Alexander Nursing Service and was sent to the front and was award the Royal Red Cross. For our February meeting we welcomed back Linda Rhodes, now retired from her post at Valence House. She gave a detailed and interesting illustrated talk on Creekmouth, a village two miles south of Barking where the River Roding (aka Barking Creek) meets the Thames. It was an isolated village with a pub named The Crooked Billet built in the 18th century and two gunpowder magazines - a self-contained community. Ships waited there before making for London, also the fishing smacks. It had a reputation as a haven for smugglers, Customs officials using an old hulk for spot checks. The Battle of Creekmouth took place in 1747 when barricades were formed against the press gangs. In the 1850s Creekmouth expanded, with new fertiliser and chemical factories built by John Lawes. He built houses for his workers, later incorporating a school and mission church. 1878 saw the Princess Alice disaster take place there. She was a pleasure ship which collided with a collier, with a loss of over 600 lives. Confusing traffic regulations were blamed and the few survivors were taken to the local school and mission church. It was thought that Creekmouth was a healthy place, free of smallpox in 1888, maybe the inhabitants were protected by breathing in the fumes from the chemical works. Dampier’s Dock was named after sea captain, author and explorer William Dampier. At one time Alexander Selkirk was a crew member, his shipwreck becoming a source for Robinson Crusoe. The village also saw some excitement, a whale being landed in 1891 and was exhibited in London. A snapshot of the village in the 1911 census showed people came from all over the country. There were large families with lodgers, with various occupations including Handley Page, aeronautical engineers (the first aircraft company in Britain, established in 1909). There was even a man who skimmed fat from the river surface and sold it – hopefully not for human consumption. In WW1 three local men died, one having a road named after him. Barking people came for a day out at Creekmouth beach, by the power station, opened by George V and Queen Mary in 1925; it closed in 1981. On 31st January 1953 the village was inundated in the east coast floods. Thankfully no-one died and people were evacuated, some being taken to the local police station. By 1954 there were still no proper facilities in the houses which were also deemed to be too close to local factories and were demolished in 1962, tenants being rehoused in the nearby Thames View Estate. The school building survived and in 1989 was sold to a demolition company for their headquarters. In 2004 the Creekmouth Preservation Society landscaped the area around the flood barrier (erected in 1982) and The Crooked Billet is now a restaurant. Some 2800 houses are to be built on the site, complete with a railway extension – a new phase for a lost village. At our March meeting we had a delightful talk by Linda Holdaway about the National Gardens Scheme (NGS). Volunteers recruit gardeners to open up their plots to the general public in aid of various charities. The scheme was formed 91 years ago and there are now 1000s of privately owned small gardens which open to the public on various days throughout the summer, some selling plants. It started in Liverpool in the 1860s after William Rathbone MP, merchant and philanthropist hired Elsie Wagg to nurse his sick wife. After her death she was retained for her services to the poor. With the help of Florence Nightingale 18 districts were created – hence the name District Nurse. More funds were obtained from the Victoria Jubilee Fund and by 1912 the nurses had bicycles. In 1926 Ms Wagg had the idea of opening gardens to the public at 1 shilling per head. This raised over £8000 (£250,000 in today’s money), and thus the NGS was born. In the early years stately homes and gardens also joined the scheme, including Sandringham, Sissinghurst Castle, Great Dixter and Hatfield House. After WW2 the scheme was expanded, George VI opening Frogmore Park; this year 70 nurses are invited there for a tea to celebrate 70 years of the NHS. Mrs Holdaway’s illustrations showed several of the 80 large and small gardens in Essex, encouraging people to get out and about. Braxted Park in Witham has a large house, lake and parkland; proceeds from open days going to the Horatio Chapple fund set up by his mother after he was killed by a polar bear at the age of 17. Our nearest garden is Barnards Farm on the A128 with a wide appeal for families. There is a large lake and sculptures by such as Antony Gormley, with a model train and vintage motor bike and car museum. There is a modest entry fee to the 3000 large and small gardens which come under the scheme, with Mary Berry as president. She was in the humorous film that Mrs Holdaway showed at the end of her talk, a skit on Bake Off. The gardens all offer refreshments with home-made cakes and many people go just for the afternoon teas provided. The NGS still supports nursing and caring and has given millions of pounds to charities. Their website and Essex Yellow Guide show places and times of opening – so, look for the yellow road signs and enjoy your outing. In 1792 the world’s first organised police force was started at Wapping. The men were paid 12 shillings a week, similar to an unskilled worker. By 1798 the number of officers was increased and seafarer John Harriott devised a plan for Thames Police Officers. There were 7000 ships in London docks each year; corruption was endemic, with a criminal network, wealth being concentrated in the docks. The police were part of the problem, turning a blind eye to brothels. Also the City of London turned their backs on events outside the city boundary. West India Dock companies provided their own police force in 1802. One by one other dock companies introduced forces, working independently. The government tried to set up a police force for London and met with opposition, but in 1829 Robert Peel put through The Metropolitan Police Act providing a permanent police force. They were expected to police the docks but did not agree to combine with docks police. We became a great power, with longer ships and needed to build new docks. In 1908 David Lloyd George created the PLA by merging the London Docks which still remained privately funded. Docks were a dangerous place and by 1930 police were issued with life jackets. Container services started in the late 1960s and the PLA, based at Tower Hill, opened an office in Tilbury in 1965. The ports were nationalised in 1966 and it was suggested their police be merged with local and British Transport police, an idea that was dropped. Today the docks are now mainly accident free. The PLA police work with Essex police and the broader community, alongside security companies and HMRC, now dealing with human trafficking, smuggling and drugs. The future is secure, still at no cost to the taxpayer. This was a very informative talk, increasing our knowledge of how our docks and its police were created. We were disappointed that our speaker for our May meeting was unable to attend but our Chairman Susan Yates ably stepped into the breach at the last minute and gave us a tour across Thurrock in old photographs, with a tale to tell for each one. Her many illustrations included Aveley, South Ockendon with its old windmill, the 1953 floods, Purfleet, Grays park and beach and Palmer’s School. She also included the Cross Keys at Chadwell (an old Seabrooke’s brewery pub), Stanford marshes, the Tilbury Hotel, Tilbury Riverside Station and Stanford le Hope. It was the days of horse and carts, with children playing in the street, lending an air of nostalgia to the evening.